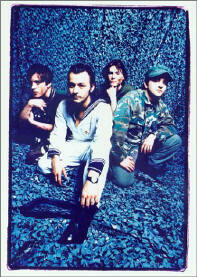 Manic Street Preachers. From Gwent garage days to Castro's Cuba. In photos. The Manic Street Preachers' Anton Corbijn, Mitch Ikeda was first hired by Sony Japan to photograph the band and ended up inside their identity, defining the group. The publishers bill it as 'the officially sanctioned visual celebration of Britain's most effective on-going populist rock'n'roll provocateurs.' The Manic Street Preachers have not been above betraying the political sensibilities which have inspired their finest work. The transition is all-apparent in Mitch Ikeda's earliest black and white shots of the '...skinny, delinquent, Gwent guerrilla guitar band', through to his colour portraits of stadium days, supporting the likes of Bon Jovi and reaching perhaps the pinnacle of their careers in performance and PR: the legendary gig in Havana's Karl Marx theatre three years ago. Their high-jinks shows and broody Che Guevaresque poses off stage make the Manics an excellent study for a talented photographer. Talent is undoubtedly the forte of the Manics' most empathic chronicler, Mitch Ikeda, who met the group when they were still a quartet, on their first Japanese tours. He obviously formed a bond which shines out of these 240 pages of photographs, inspiringly laid out by the band's regular album designer Mark Farrow. The majority of shots here are previously unseen, making the large-format book a value buy. The 'Holy Bible' era images will sear deepest into the memory for it's here that the band looks youngest, sharpest, keenest and most anarchical. The photos of Richey document his downward spiral, though some of the earlier shots are actually light-hearted. Like the picture of him with his parents is heartbreaking when you look at the loving, proud smiles. All is put in context in the foreword by music journalist, Manics pal and 'England's Dreaming' author, Jon Savage. The final-word images in 'Forever Delayed' are distilled from over a decade of Ikeda's work, where he collaborated on albums, posters and editorial, and reacted to their shifting myth as the Manics ricocheted from arriviste glam punks, burning a hole in early 90s baggy indie-land, to socially acute mass heroes (against the class zeros) determined to keep the band's spirit alive after the mid 90s disappearance of Richey Edwards. There's great live shots, and then there's one of Nicky Wire eating eggs, beans and chips. One of the most telling is that of James Dean Bradfield outside his family's terraced red-brick home early on the morning the band departs on an early UK tour. He looks nervous, and excited, like a teenager leaving home for college for the first time. The photos certainly manage to do what the publishers promise in the really capture the four members in 'Manic Street Preacher' mode and as human beings - particularly touching are the many photos of Richey, which portray him as he really was - not so much the tortured artist, more the friend and, most sadly, the son. Completists will go positively ga-ga over this latest piece of Manics product. Regular music fans, and not necessarily manic Manics fans, will enjoy the book as a very well produced documentary of the rise and peak of a great band by a talented photographer with an eye for the unusual and personal shot. It would be gratifying if the Manic Street Preachers were less a bunch of hypocrites more of the time but for now they're about the most talented troupe we've got in Europe's ranks of melodic political commentators. The band now owns a club in Cardiff. But their connivance with the forces they regularly attack was apparent at an exhibition of photos from the book in a London gallery. The exhibition was sponsored by international upper-crust cigarette maker, Davidoff. Buy new or second hand copies of the book 'Forever Delayed' from Amazon.